I had a bit of yarn left over after knitting the Petite Facile Pullover, and with it I decided to knit a hat for Gregory. 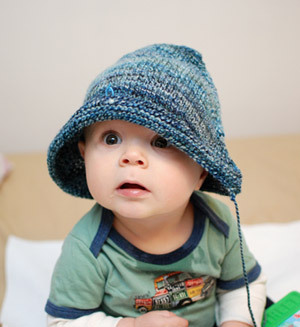 As we all know, handspun yarn + baby hat = WIN! Up to now he’s been wearing a number of handknit hats, including two I knit myself, and one Danielle knit for him. The Top Down Bonnet proved to be the most popular of the three, since the ties under the chin prevent the hat from slipping off. But it became woefully small about a month ago, neither covering his neck, nor his ears. So I decided to knit another! Easier said than done. Somewhere between a yarn with a different gauge and slightly altering the shaping to make sure Gregory’s neck and ears would be covered, I ended up with a sunhat-ish gnome/hobbit hat. Or something like that. I ripped and reknit at least 4 times, and I’m generally pleased with the final result. The shaping is perfect for Gregory’s head – the benefit of having the intended recipient on hand at all times – and the hat fits almost like a little helmet. On the minus side, I think the hat could be just a tad shorter, but I didn’t have it in me to rip and reknit yet another time. Motherhood: killing perfectionist tendencies, one knitter at a time. Next to my grandchild, that is the cutest baby ever! Keep those pictures coming! He’s adorable – look at those big eyes! oh mah gah your child is adorable. Your son is the cutest model ever. 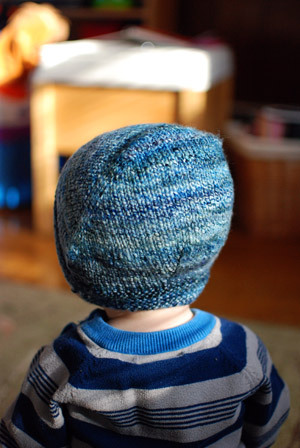 I follow your blog because I admire your knitting but now I always hope for a photo of your son when it shows up in my reader. Sorry, but another aspect of motherhood is becoming invisible in the presence of such cuteness. That first picture is absolutely priceless! Every time I think he can’t get cuter, you post a picture to prove me wrong. Since becoming a mom I have learned to live by the saying that sometimes good enough is good enough. The hat is lovely and the model totally adorable! I love Gregory’s expression in the gnome pic! The final hat came out really well, but I gotta say I have a soft spot for the gnome sunhat! Your hat – 4-5 times – turned out beautiful!! Sure do love to see Gregory grow!! Yep, that is EXACTLY what motherhood does. Celebrate it! Oh, and that is one very cute hat… and model. Cute hat! (even the floppy gnomy one!). Cuter model! the hat is gorgeous, but not half as gorgeous as kid wearing it. seriously, he is one of the cutest babies i have ever seen! i think gregory should be a professional knitwear model. Your baby has such a cute little face! Beautiful hat too! He is just so adorable and the hat in all its variations is too. Glad to know someone else has to rip a childs hat a few times. I was making a bebe beret and made everyone crazy trying to make it fit right. It is good when the model is there and he makes a truly precious one. He’s just cute! Now I just to go knit some for my new baby niece’s arrival! He’s quite the cooperative model! And I see that you’re perfectionist enough that he doesn’t have rice cereal or some other oddment stuck to his sweet little cheeks. I’ve had this hat in the queue so long I’d forgotten about it. Seeing it look so cute makes me want to make one for my little guy (22 mo) right away! Love it! it’s soooo cute! i love the third picture most – it’s fantastic! great photos great head – wonderful, cute baby!!! One of the sunhat style pictures is completely adorable. It might not have been what you were intending, but I hope you make a sunhat for him this summer. I always found that baby hats either didn’t cover the ears, or didn’t cover the forhead. Some of the really popular patterns for helmet style hats (nothing to tie, they stay on well unless they are too loose), leave so much of the forhead exposed! Your hat looks perfect! Ah, but your son is perfect! OMG! He has got to be the cutest most expressive baby I’ve seen in along time. Thanks for sharing..and the reknits of that hat were worth it …it turned out great. 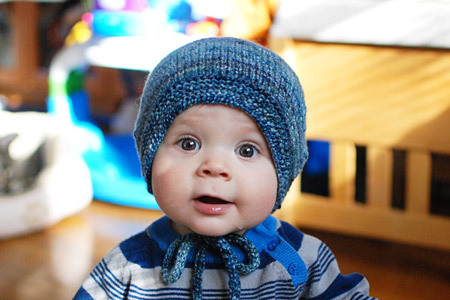 Darling hat..as a mother of sons, I have to tell you that your boy is just the cutest thing I have seen in a long time! He makes me giggle! Every time you post a picture of Gregory, I can’t stop smiling. I can’t get enough of pictures of your little lad. Those bright eyes, always seeming inquisitive, as if he couldn’t wait to see every exciting thing in the big old world! Thanks for posting such great shots. Keep them coming! You should really put Gregory in magazines, or movies, or something. So so cute. He is the cutest baby. Those eyes!! My opinion? Neither he, nor the hat, could be any more perfect!! Grin. He’s adorable in both versions! 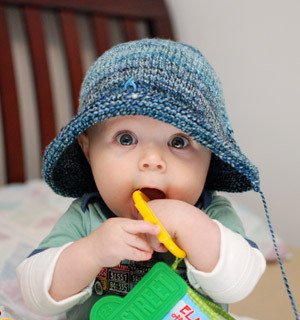 Your son looks oh-so cute in that hat and the hat’s a lovely creation too! Simply the Cutest. Baby. Evah. OMG! I just want to chomp on those cheeks! Love the hat! I love the superlarge hat. I know that it is totally not practical but oh so cute. The last version is definitely cute. Anything that kiddo wears will be cute. Holy cow, could your kid be any cuter? Keep the pics coming, please! Your baby boy is sooooooo cute. You could put an old sock on his head, and he’d still steal the show. Oh, were you showing us a hat? That is one cute little boy you have there! 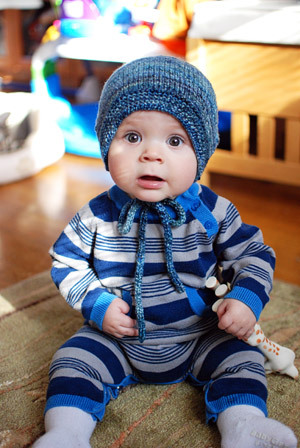 Awww – the hat is so adorable and all these wonderfully gorgeous Gregory photos just made my day. What a cutie. I have three kids of my own (6, 5 and 2) so I’m pretty biased – but holy crap is Gregory gorgeous! The hat rocks too! And, the hat will probably fit next year also. The cute factor is on overload! What a beautiful child! The knitting is pretty fab, too! Oh my goodness – he is so very adorable and photogenic. I swear – it almost, but not quite makes me think my husband and I should have a child. Wait, nope. But he is ever so sweet. Thank you for sharing!